I hope you like everything you see. I will try to add more stuff as soon as I can. I want you to know that if you are looking for something and you don't see it on my site let me know because I do take special order's. To Place an order just send me an e-mail. Ohio residents has to pay a sales tax for the county that they live in. 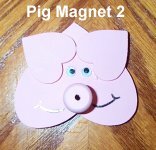 Looking for magnets for your refrigerator or a small gift for someone? This can be added into a card or put on a package your giving to someone or just get it for yourself. Price is $1.50. Postage not included. Here are some bigger magnets. I will have a lot more to come as soon as I can. The price is $2.00 and does not include postage. Looking for a small gift for a teacher? This wood apple wood be a great gift to give. The one's showing is in blue and red. I do have 2 that are green that are not showing. Price for one is $3.00. Postage not included. Do you like to collect pigs? Here are a couple of pigs that I have done up in wood. Patterns came out of Crafting Traditions Magazines. A great magazine to have. Price for one of the magnets is $3.00. Postage not included. Looking for a Holiday magents? I had a couple here. Maybe more later. I have a Santa ornament and the other is a ghost magent. Price for one of these is $3.00. Postage not included.